AWS can schedule events for your instances, such as a reboot, stop/start, or retirement. These events do not occur frequently. If one of your instances will be affected by a scheduled event, AWS sends an email to the email address that's associated with your AWS account prior to the scheduled event. The email provides details about the event, including the start and end date. Depending on the event, you might be able to take action to control the timing of the event. To update the contact information for your account so that you can be sure to be notified about scheduled events, go to the Account Settings page. Instance stop: The instance will be stopped. When you start it again, it's migrated to a new host. Applies only to instances backed by Amazon EBS. Instance retirement: The instance will be stopped if it is backed by Amazon EBS, or terminated if it is backed by instance store. Instance reboot: The instance will be rebooted. System reboot: The host for the instance will be rebooted. System maintenance: The instance might be temporarily affected by network maintenance or power maintenance. In addition to receiving notification of scheduled events in email, you can check for scheduled events using one of the following methods. In the navigation pane, choose Events. Any resources with an associated event are displayed. You can filter by resource type, or by specific event types. You can select the resource to view details. Alternatively, in the navigation pane, choose EC2 Dashboard. Any resources with an associated event are displayed under Scheduled Events. Some events are also shown for affected resources. For example, in the navigation pane, choose Instances and select an instance. If the instance has an associated instance stop or instance retirement event, it is displayed in the lower pane. aws ec2 describe-instance-status --instance-id i-1234567890abcdef0 --query "InstanceStatuses.Events"
The following is example output with information about a scheduled system reboot event, in JSON format. The following is example output with information about a system reboot event that was canceled and a system reboot event that was completed, in JSON format. When AWS detects irreparable failure of the underlying host for your instance, it schedules the instance to stop or terminate, depending on the type of root device for the instance. If the root device is an EBS volume, the instance is scheduled to stop. If the root device is an instance store volume, the instance is scheduled to terminate. For more information, see Instance Retirement. Any data stored on instance store volumes is lost when an instance is stopped or terminated. This includes instance store volumes that are attached to an instance that has an EBS volume as the root device. Be sure to save data from your instance store volumes that you will need later before the instance is stopped or terminated. You can wait for the instance to stop as scheduled. Alternatively, you can stop and start the instance yourself, which migrates it to a new host. For more information about stopping your instance, in addition to information about the changes to your instance configuration when it's stopped, see Stop and Start Your Instance. You can automate an immediate stop and start in response to a scheduled instance stop event. For more information, see Automating Actions for EC2 Instances in the AWS Health User Guide. We recommend that you launch a replacement instance from your most recent AMI and migrate all necessary data to the replacement instance before the instance is scheduled to terminate. Then, you can terminate the original instance, or wait for it to terminate as scheduled. When AWS must perform tasks such as installing updates or maintaining the underlying host, it can schedule the instance or the underlying host for a reboot. You can reschedule most reboot events so that your instance is rebooted at a specific date and time that suits you. You can view whether a reboot event is an instance reboot or a system reboot using the AWS Management Console, AWS CLI, or Amazon EC2 API. Choose Instance resources from the filter list. For each instance, view the value in the Event Type column. The value is either system-reboot or instance-reboot. You can wait for the instance reboot to occur within its scheduled maintenance window, reschedule the instance reboot to a date and time that suits you, or reboot the instance yourself at a time that is convenient for you. After your instance is rebooted, the scheduled event is cleared and the event's description is updated. The pending maintenance to the underlying host is completed, and you can begin using your instance again after it has fully booted. It is not possible for you to reboot the system yourself. You can wait for the system reboot to occur during its scheduled maintenance window, or you can reschedule the system reboot to a date and time that suits you. A system reboot typically completes in a matter of minutes. After the system reboot has occurred, the instance retains its IP address and DNS name, and any data on local instance store volumes is preserved. After the system reboot is complete, the scheduled event for the instance is cleared, and you can verify that the software on your instance is operating as expected. Alternatively, if it is necessary to maintain the instance at a different time and you can't reschedule the system reboot, then you can stop and start an Amazon EBS-backed instance, which migrates it to a new host. However, the data on the local instance store volumes is not preserved. You can also automate an immediate instance stop and start in response to a scheduled system reboot event. For more information, see Automating Actions for EC2 Instances in the AWS Health User Guide. For an instance store-backed instance, if you can't reschedule the system reboot, then you can launch a replacement instance from your most recent AMI, migrate all necessary data to the replacement instance before the scheduled maintenance window, and then terminate the original instance. You can reschedule most reboot events so that your instance is rebooted at a specific date and time that suits you. Select one or more instances, and then choose Actions, Schedule Event. Only events that have an event deadline date, indicated by a value for Event Deadline, can be rescheduled. For Event start time, enter a new date and time for the reboot. The new date and time must fall before the Event Deadline. It might take 1-2 minutes for the updated event start time to reflect in the console. To reschedule the event, use the modify-instance-event-start-time command. Specify the new event start time using the not-before parameter. The new event start time must fall before the NotBeforeDeadline. It might take 1-2 minutes before the describe-instance-status command returns the updated not-before parameter value. Only reboot events with an event deadline date can be rescheduled. The event can be rescheduled up to the event deadline date. The Event Deadline column in the console and the NotBeforeDeadline field in the AWS CLI indicate if the event has a deadline date. Only reboot events that have not yet started can be rescheduled. The Start Time column in the console and the NotBefore field in the AWS CLI indicate the event start time. Reboot events that are scheduled to start in the next 5 minutes cannot be rescheduled. The new event start time must be at least 60 minutes from the current time. If you reschedule multiple events using the console, the event deadline date is determined by the event with earliest event deadline date. When AWS must maintain the underlying host for an instance, it schedules the instance for maintenance. There are two types of maintenance events: network maintenance and power maintenance. During network maintenance, scheduled instances lose network connectivity for a brief period of time. Normal network connectivity to your instance will be restored after maintenance is complete. During power maintenance, scheduled instances are taken offline for a brief period, and then rebooted. When a reboot is performed, all of your instance's configuration settings are retained. After your instance has rebooted (this normally takes a few minutes), verify that your application is working as expected. At this point, your instance should no longer have a scheduled event associated with it, or the description of the scheduled event begins with [Completed]. It sometimes takes up to 1 hour for the instance status description to refresh. 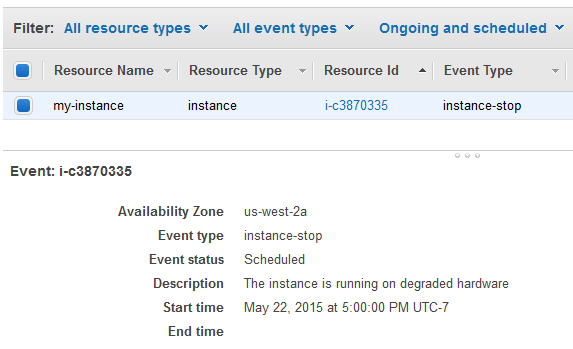 Completed maintenance events are displayed on the Amazon EC2 console dashboard for up to a week. You can wait for the maintenance to occur as scheduled. Alternatively, you can stop and start the instance, which migrates it to a new host. For more information about stopping your instance, in addition to information about the changes to your instance configuration when it's stopped, see Stop and Start Your Instance. You can automate an immediate stop and start in response to a scheduled maintenance event. For more information, see Automating Actions for EC2 Instances in the AWS Health User Guide. You can wait for the maintenance to occur as scheduled. Alternatively, if you want to maintain normal operation during a scheduled maintenance window, you can launch a replacement instance from your most recent AMI, migrate all necessary data to the replacement instance before the scheduled maintenance window, and then terminate the original instance.